Take a look at the latest works of editorial or contact them in Boston directly. Find on Production Paradise the best creative professionals and production services for . Welcome to our debut issue of Showcase New England, brought to you by Production Paradise. This issue features some of the leading creative talents and services working out of New England, including photographers, photo agents, production companies, and rental studios. More creative professionals and facilities for photographic and film production are available in our brand new Boston Photo and Film directories. Candice Breitz: Love Story, until 21st January at the Museum of Fine Arts, Boston. This immersive video installation juxtaposes first-person stories told by refugees with re-performances of their narratives by Hollywood stars. Richard Avedon: Portraits, 1952-1970 at Portland Museum of Art, until 17th February. This exhibition showcases 12 photographic portraits and three triptychs of celebrated individuals by the iconic American photographer. Dennis Hopper: The Lost Album, until 27th January at New Britain Museum of American Art, showcases a landmark body of over 400 photographs by Hopper that were only recently rediscovered following his death in 2010. Our cover image was shot by portrait and celebrity photographer Emily Assiran. 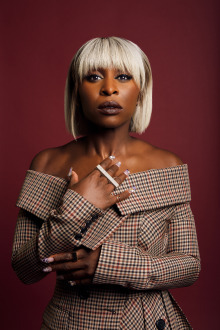 The editorial features a portrait series of actress Cynthia Erivo.